Every year at the end of the academic year, a significant amount of waste amasses from colleges all over the country due to students' throwing away items they can't or don't want to bring home with them for the summer. Often times, the waste from residence halls is comprised of items that could easily be reused such as clothes, furniture, appliances and books. In order to minimize waste, the Office of Sustainability sets up Move-Out stations across campus where students can donate their no-longer-wanted items. 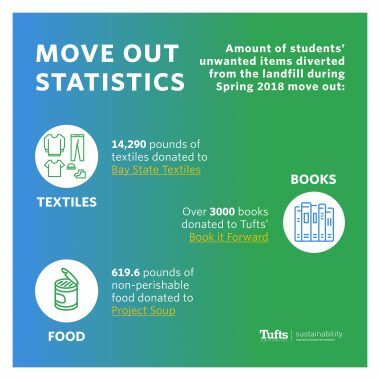 Tufts' Move-Out was featured in a 2018 Boston Globe article! What happens to all the donated items? Many of the items collected during move out are college-specific and could easily be reused by other students - lamps, storage containers, rugs, side tables, etc. 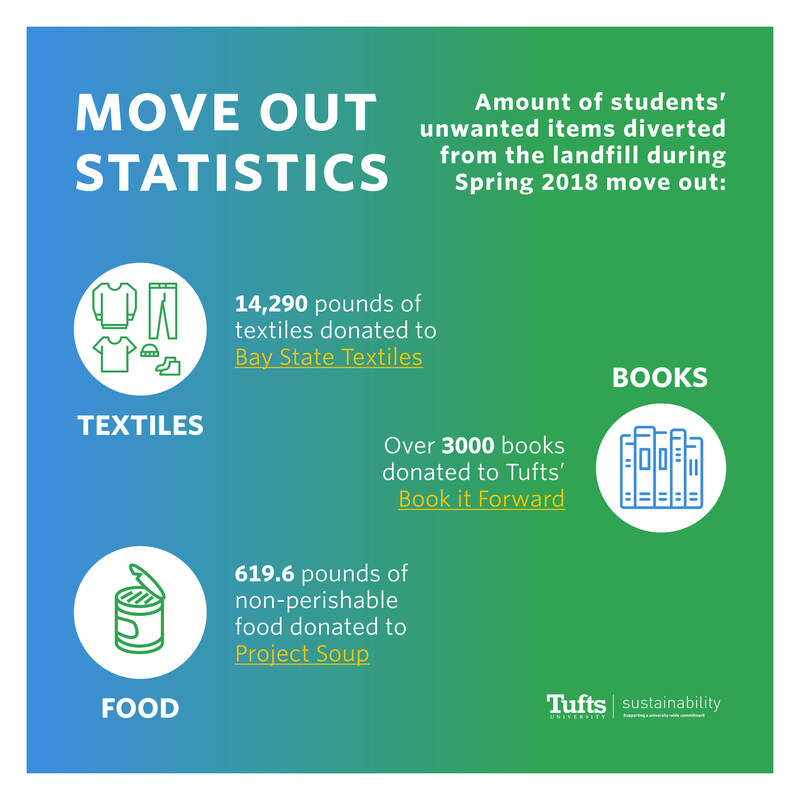 Since fall 2017, the Green House, Tufts' sustainable-living specialty housing unit, has hosted a back-to-school sale in the fall with these items. The items are sorted, stored and cleaned over the summer and sold back to students at a very affordable rate. Hangers, of which an enormous amount are collected, are handed out for free. This helps incoming freshmen and returning students save money, and helps reduce the amount of items purchased anew at the beginning of the school year. Books collected during the sale go to the Book-It-Forward Lending Library, which allows Tufts students on financial aid to borrow textbooks for the school year. Non-perishable food items are donated to Project Soup, a local food pantry that is a part of the Somerville Homeless Coalition. Textile donations including clothing too worn to be sold in the sale or old sheets and towels are donated to Bay State Textiles.